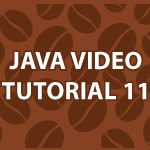 In this part of my Java Video Tutorial I introduce Java collection classes. Specifically I cover how to use Java ArrayLists. Java ArrayLists make it easy to keep track of groups of objects. A Java ArrayList differs from a java array in that it automatically resizes itself when you add or remove values. I’ll go over nearly every Java ArrayList method in the video below. The code follows the video and it is heavily commented to help you learn easily. // are easy to add to and delete from. Hey Derek i am a keen follower of your website,i just want to say that these tutorials are awesome and i hope u will put some programming tutorials on c++.God bless you. derek u have done an awesome job by developing this kind of website.God bless u!! Hi master. I have small problem.﻿ How can I put objects from different classes to one ArrayList? Sorry, there was propably white symbol. It’s working 🙂 You can delete this post. Are they subclasses from the same class? How many ArrayLists can you create in one file? If you can create more than one, then how do you specify which arraylist you are adding elements to? names.add() seems very general. Thank you very much 🙂 Everyone I talk to recommends the Head First Java book. I can’t think of a book that gets more good reviews. Stay away from technical books like Thinking in Java and you’ll be fine. Thanks Derek. I’ve been using Head First Java. It is a good book. Tell me why do we need Object array to copy the arraylist into. I am getting the same thing by doing this. any specific reason doing that way and also not giving the object array size doesnt make any difference.Even after putting 1 in the arraysize,the output is showing all the nameCopy list items. I dont understand what is going on at the backside. that’s what i love in your tutorial, u explain in a modular way. great..
– Thank You for the tutorials – much obliged – ! Hey Darek.. I just wanna say..
i didnt understand the math.random method. plz explain me. This gives you a number between 0 and 9. rand.nextInt(10) + 1; would give you numbers between 1 and 10. Thanks again Derek.. I understood now!! Is it possible to add String to an ArrayList? I tried but it does’nt seems to works.